The ramp stops at the top and bottom. To turn around, let go of the button and then hold it again. Nice! It will be manipulated according the user’s will! The top/bottom blinks were initially added as part of an auto-reversing UI, but I’m not sure they make any sense in a UI which stops on its own. It’s not generally hard to tell that it has stopped, especially at the bottom end. However, it can be difficult to gauge how far up the ramp the light is. I suppose that Crescendo is the case you mentioned. I’ve been using it (and like it a lot!!! Thanks TK!!) in a modded light but the auto-reversing is a bit “awkward” specially comparing witrh the Emisar D4 UI. It takes longer to get used to. This said, I guess that sometimes it is harder to see when the top is reached, not the bottom. And that was the reason why I posted C and D as my options. The highest luminosity seems harder to control or to “eye-measure” than the lowest. I still think that the blinks make sense to avoid pressing the button like there was no tomorrow and to mark some points while ramping. I configure mine with a blink at channel boundaries only. This lets me know if I should expect more than 8 hours of runtime, between 1 and 8 hours, or less than 1 hour. This might be the only thing why I wold add the B mark, to know what to expect in terms of battery, as the highest regulation surely implies more drain than the 1st 7135 limit. Still, so far I maintain my suggestion C and D.
Also, I have one question. 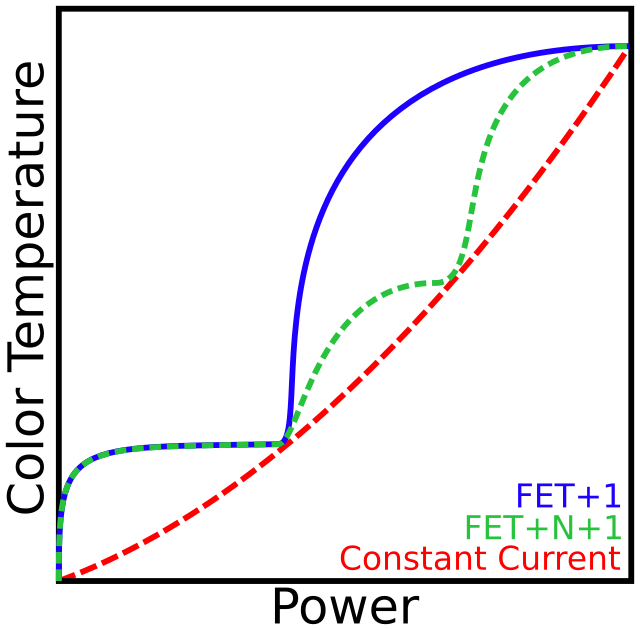 Would the passage from full regulation to FET work as in the Emisar D4, meaning: after passinf that limit, and depending on the use LEDs that will be used, is it probable to see a “tint shift”? I have the D4 with XP-G2 S4 3D and I experience that “shift”. Don’t know how others react, and also don’t know it is supposed to expect that change on the new setting, after the regulation passage. Please ignore my question if it is nonsense And thanks again for the work done so far. Can we have the default level for power on set to level 62, please? I dont think someone see a difference between 142 and 160 lumen and the 2h more seems to be a good trade-off. Optical programming seems the most promising. But a lot of work and time. A sunrise mode, please no. I think it’s to hard to set with the lamp. And the µC cant sleep. Leave room, it’s already feature packed. If you print it on a b/w laser printer you can’t distinguish the green and black lines very well. Mabye if they are fatter? The script rounded to the nearest integer, since the values are all approximate anyway. Please add my name to the "interested" list for one light (first request). one thing for the flow chart: If you print it on a b/w laser printer you can’t distinguish the green and black lines very well. Hmm, I’ll keep that in mind in case the diagram ships with the light. For now though, the .svg file is in the repository, and should work in Inkscape (free, runs on several OSes). Do we have a current photo of the external design as of now? Target production date or release date? Not sure I’m familiar with negative voting. Can you just run raw numbers of for an option next to it? Also if people cannot stop at B and C, what will it accomplish? And force stopping would not be desirable I don’t think. The top/bottom blinks were initially added as part of an auto-reversing UI, but I’m not sure they make any sense in a UI which stops on its own. It’s not generally hard to tell that it has stopped, especially at the bottom end. However, it can be difficult to gauge how far up the ramp the light is. I configure mine with a blink at channel boundaries only. This lets me know if I should expect more than 8 hours of runtime, between 1 and 8 hours, or less than 1 hour. None of the options should be an issue for anyone with firmware flashing tools, but I hope to make the default agreeable to as many people as possible. So far, it sounds like that means option C only, a blink at the highest regulated level before the FET kicks in. That also happens to be where the ceiling is set by default, which would mean it has a blink at the top of the ramp unless the user changes the ceiling level. It can be whatever you like. Also if people cannot stop at B and C, what will it accomplish? I think people have forgotten that you can ramp both upward and downward. As you ramp down, you see the blink and you release the button. Done. True, so you have to either pass it from low to high and stop and ramp back down or start ramping from above. Put me on the list for one please. I’m interested for 1 piece, so please put me on the list. I frequently can’t tell if my Skilhunt H03 (last mode memory) is on medium (70lm) or high (160lm) until I cycle through the modes. The difference in modes is 10hours vs 5 hours runtime. As far as missing the channel blink, it could be programmed to stop there instead of just blink, then a new press would continue on in the ramp. But then, that would interrupt the ramp and all sorts of other issue. I don’t mind passing it going up then getting close coming back down, it means the lights output is just shy of maxed out on the 7135 chip so regulation is good. Stopping just over the blink of course has the FET engaged and you’ve entered into not-so-efficient territory. AS IF this were critical. In critical situations a spare cell should be readily available anyway, right? So, I like the blink top and bottom, and the blink at the channel change. Where in the soup does that put my preference? Out of curiosity, I tried making the smooth ramp blink every time it passed a stepped ramp level. This would make the number and placement of blinks configurable… but in practice it was mostly just annoying. Then again, the default config had 7 steps. 999 … thebaum … 2º nd? Traditional style: Low/med/high/off sequence, 10/80/300 lm. Training wheels style: Simplified smooth ramp, 5 lm to 300 lm. About another mood mode, I don’t have anything particular in mind. But if someone has a good idea, maybe it can happen. I’m not sure if there’s enough space left for optical programming or not. It’s definitely the most work out of the things I mentioned, and I’d need to physically modify this FW3A prototype in order to do the development. Perhaps after the second prototype is made, I can turn the first one into a dedicated development host. For now though, I need it intact for thermal testing. I don’t like “traditional” style as muggle mode. So either “training wheels” or “dead simple”. I suppose “training wheels” should be simple enough to learn about after a few minutes usage, so I’d more likely go for “training wheels” muggle mode. I would like to see blinks at A, C, and D. I like those blinks on my D4, and how I describe the brightness to people depends on the middle blink. How do the steps work? Does it pause at each step? It works the same as the smooth ramp, except it only uses the configured steps, and each step is held for about 0.4 seconds. It’s similar to an Olight Baton interface, plus the ability to go down instead of only up. If the button is held, it will keep ramping until the user lets go or until it hits the end of the ramp. BTW, I’m not clear on what your vote is now. It was AD, but now it sounds like maybe C or None? Muggle 3 level is good. I like the 5-300lm ramp muggle mode. If they don’t hold the switch, then they’ll never know it’s ramping capability and it will behave as a single mode. Looks fantastic and would give my HG2’s a proper workout. My first post too – hi to everyone in BLF.